The KAUST Supercomputing Core Laboratory (KSL) is pleased to invite you to a two-day workshop on data science workflows on its flagship supercomputer, Shaheen. KSL staff has recently installed a novel big data analytics software suite, called Urika-XC. This new service offered by KSL breaks grounds by providing advanced analytics, artificial intelligence (AI), deep learning applications and graph tools, specifically engineered for supercomputers like Shaheen. Solution architect and big data expert, Dr. Jim Maltby, together with principal engineer, Dr. Kristyn Maschhoff, will give a detailed description of Cray Urika-XC. Through informative examples and a hands-on tutorial session, users will learn how to use the building blocks of Cray Urika-XC including Tensorflow, Pytorch, R and Spark. Attendees will be provided with an ideal toolbox to implement, solve and test big data analytics or deep learning workflows at scale. All KAUST researchers, students, and managers are warmly welcomed to join the event. Seats are limited, therefore please register here. For more information, please visit Core Labs website or contact training@hpc.kaust.edu.sa. This event is brought to you by KAUST Core Labs. Dr. James Maltby is a Solution Architect for Cray, Inc. and specializes in mapping scientific and business applications to new computer architectures. 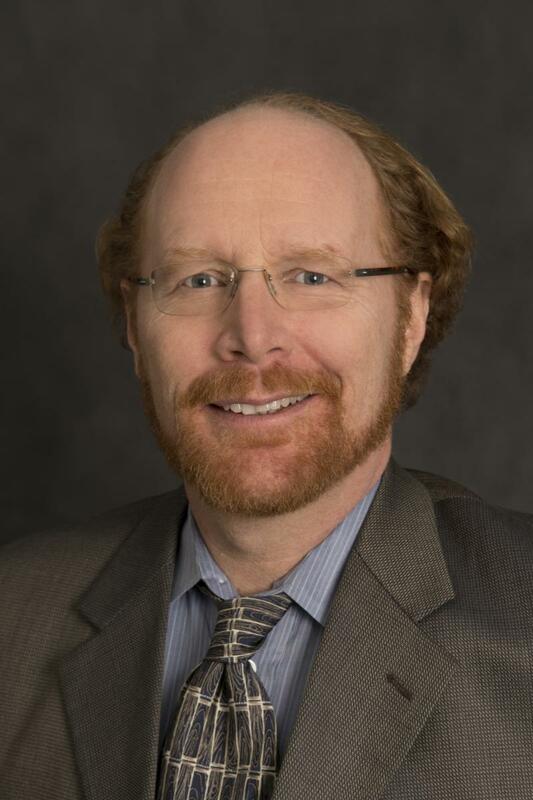 He has an academic background in physics and engineering, specializing in radiation transport. He has worked for Cray since 2000, developing software for the massively multithreaded Cray XMT as a well as the other Cray systems. He also led the Bioinformatics practice at Cray for several years, using HPC to solve Life Science problems. In addition, he wrote a highly parallel in-memory Semantic Graph Database for the XMT architecture. His most recent project involved developing a Scalable Deep Learning and Analytics package for the Cray XC series of supercomputers, now available as Urika-XC. Dr. Kristyn Maschhoff is a principal engineer in the Analytics R&D division of Cray. She has worked at Cray for 21 years. 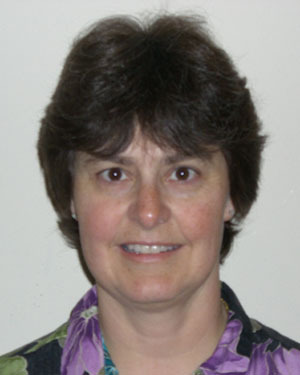 Her work at Cray has included development of numerical libraries, member of the Applications and Benchmarking group, management of the Cray Applications team, technical project lead for Performance for the Cascade project, developer for the Cray Graph Engine, and most recently, providing applications support for multiple analytics applications across Cray platforms, including machine learning applications. Her experience at Cray covers multiple architectures: Cray MTA/XMT, SV1/X1, XD1, XT/XE/XC systems, and Cray’s analytic systems Urika GD, Urika XA, Urika GX, and Urika XC. She received her PhD in applied mathematics from the University of Washington in 1994, and her BS in Electrical Engineering from the University of New Mexico in 1986. The pdf version of the agenda of the event can be found here. This two-day tutorial will cover all the packages in Urika-XC. The format will be primarily lecture, with live demonstrations and the opportunity for hands-on exercises. Click here to register for the event. Please note that seating for this hands-on event is limited. All lectures will take place in the Auditorium 215, level 0 between buildings 2-3 (green square). 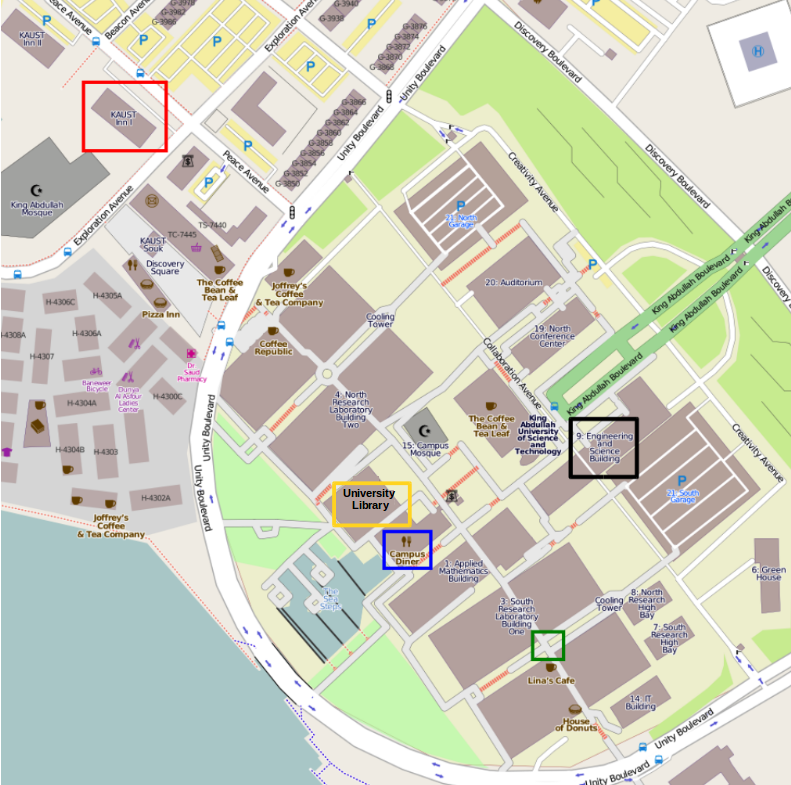 The workshop location is a 10 min walk from the KAUST Inn (red square) and the campus diner (blue square) for the regular lunch is 5 min away from the workshop location. Please contact us at training@hpc.kaust.edu.sa if you need further information.